I've been rewatching the Nickelodeon cartoon series Avatar: the Last Airbender this week. It's a delightful show that's a perfect blend of western storytelling and eastern/anime imagery. A story of a boy named Aang who is a being called the Avatar, an embodiment of the spiritual essence of the earth and commander of all four elements. In the world of the show, there are four nations that correlate to the four traditional elements - Earth, Air, Fire, and Water. Within each nation there are people known as benders who can mystically manipulate their nation's respective element. The show discusses balance within ourselves, living in harmony with the earth and those around us, and preaches a fair bit of good advice and spiritual insight. Every now and then, a show like this comes around. Avatar (the movie about blue aliens, not the atrocious film adaptation of the aforementioned TV show), the Mists of Avalon, even children's shows like Nightmare Before Christmas and Halloweentown have all been drooled over by witchy folk. I was asked this week on social media if I could discuss the magical and pagan connections of Avatar: The Last Airbender on a future show, to which I responded that sometimes a show is just a show. It's entertainment. This is nowhere near the first time I - and other pagan public people - have been asked similar requests. Recently, a post on the Wild Hunt detailed how pagans around the internet are tearing apart their pointy hats over a new movie called The Conjuring. Now, I've not seen the movie, but I know it's supposed to be scary, and there's possession and witches and did I mention it's supposed to be scary? Suffice to say, I'm totally in. Definitely can't wait to see this movie. It was your standard "blame the witch from salem and sacrificing baby to satan" hollywood line ---- it's hollywood, what can else do you expect, ya know? that's how I looked at it anyway, but the actual story of the brutality of the possession and how the Warrens helped the family, is what I focused on, in between the terror of what was going on. Just looking at it as a horror film, I thought it was great. 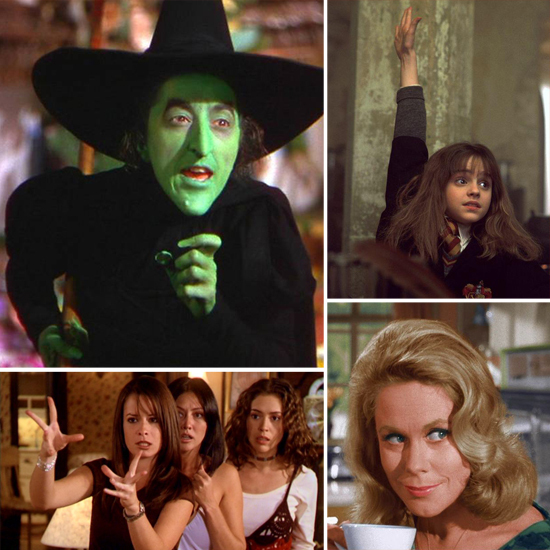 It's important to remember that witches are not just real people that have existed in nearly every known culture throughout time, but they're also a great plot device. In an article on bee colony collapse that's floating around the internet today, there was a quote about a 'witches' brew of pesticides'. It's descriptive. It's effective. And, that's how witches can be seen - either positively or negatively - throughout the land of story. They're there to help drive the plot. Sometimes they're a happy red head who's offering you some sassy shoes, sometimes they're delivering baked goods, and others they're poisoning crops or summoning spirits to cause chaos and pain. I think there's an important disconnect that we need to attain when we label ourselves as witches, pagans, polytheists, etc. You need to realize that you are defining it in a real world context. There are green skinned witches flying on brooms, enlisting the aide of bees and winged monkeys. A witch can't twitch her nose and incite wacky neighborhood hijinks. You and your sisters aren't the Chosen Three. The list goes on. As such, many of the connections we'd like to make with film and literature are simply false. We. Aren't. Them. The quicker we own that, the more headaches we'll save ourselves. To attempt to make magical connections, to codify aspects of a children's show as pagan, is to apply false labels. We are attempting to relate to a non-real fable. However, what you can and should do is allow the bits that resonate the most to you to simply resonate. If you like the notion of living in harmony with the earth, then allow that notion to positively influence your life. Recycle more. Plant a garden. Do the stuff. If you think all spellcraft should be spoken in rhyme, then write your spells that way. But, realize there is only so much of these shows and books that should be influencing you. You cannot fully escape the real world and hop across the dimensional plane and go to Hogwarts or Brakebills or fight the Fire Lord or deliver donuts with Jiji or turn people into immortal black cats. Nice ideas? Great. Incorporate those. But, let's leave the inappropriate associations where they belong, on the screen while we're on the couch with some popcorn. "...detailed how pagans around the internet are tearing apart their pointy hats over a new movie called The Conjuring..."
Is that the takeaway you got from my piece? Because I only quote one Pagan, and then only briefly. To be honest, I don't really care about the content of the movie per se, but I do care about how it's being marketed, and who the real-life people are fueling the narrative. That stuff, I think, deserves some looking at. Which is why I wrote the piece. Believe it or not, I'm actually quite hesitant to critique pop-culture stuff, because I'm not the type to get bent out of shape about fantasy witches or Christian tropes. I have made the distinction between fantasy witchcraft and real Witches on many occasions. In any case, perhaps I have failed to be nuanced enough in my post? I was very careful to make no calls to action, or to call for anything really, other than to be more discerning about how projects like this get sold. Sorry Jason - I suppose I should clarify. I copied the wrong link. I intended to link to the quote you had from Christian Day regarding the Conjuring. Also, I should have possibly gotten more in depth into the quotes from various other blogs and social media presences. Suffice to say, I do not think YOU are upset with the Conjuring, but that you highlighted that others found it distasteful, a misrepresentation of real witches etc. In that, I am the one who was not careful enough in my posting, I suppose.